TINY GUITARS OR GIANT PEOPLE? YOU DECIDE! 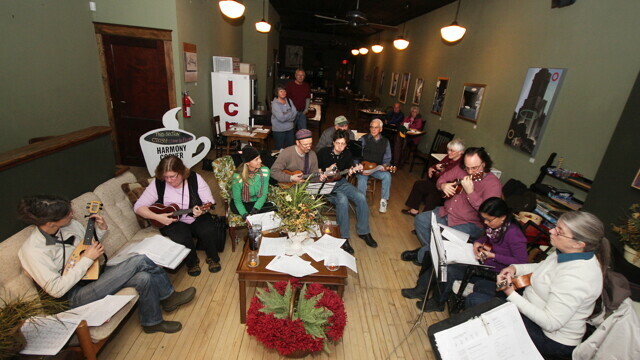 The Ukulele Club meets at Harmony Corner Café the third Tuesday of every month. And they play Neil Diamond. After going to Milwaukee Ukulele Festival last September, local guitar-making master Gordy Bischoff was determined to bring the celebration to the Chippewa Valley. Not only did he start crafting his own ukuleles, but also developed an interest in learning how the play the instrument himself. Bischoff, along with a few others tried to start a regular group, but it didn’t quite take off. Meanwhile, Eau Clarian Stasia Vishnevsky had recently picked up her ukulele for the first time in several years, and was itching to play with others who shared her passion. The inaugural meeting took place in January, with a handful of eager ukulelists. After promoting the group through avenues such as Facebook and VolumeOne.org, the group swelled to more than two dozen active members, and even more occasional visitors – people including Magic Mama, Caleb Horne (EverGreen Grass Band), Peter Phippen, and Evan Middlesworth. The group meets the third Tuesday of every month at Harmony Corner Café, with a social hour from 6 to 7pm, and a group jam session from 7 to 9pm. The remaining time is used to discuss business – gigs. Thus far the group has opened for Al Julson and Larry Past, a local performing duo, and are hoping to have their own performances this summer.